Political Players is a weekly conversation with the leaders, consultants, and activists who are shaping American politics. This week, CBS News' Brian Goldsmith talked with Republican Gov. Tim Pawlenty of Minnesota, a leading McCain supporter, about whether his candidate can come back from the political dead -- and whether his party's nominee can carry traditionally Democratic Minnesota. CBSNews.com: You endorsed Senator McCain for president last January when he was the presumed Republican frontrunner. Some of his allies since then have jumped what they think is a sinking ship. Are you as confident now as you were then that he'll be the nominee? Tim Pawlenty: I'm confident that Senator McCain is the best person to be the next President of the United States. He has the most relevant experience. He is also one of the most courageous leaders that our country has seen in many years. He is steadfast. He is strong. He's experienced. And I strongly support him. CBSNews.com: You're one of his national chairmen. What steps have you taken to support his campaign? Tim Pawlenty: My role as national co-chair for the senator has been honorary or ceremonial. I haven't been involved in the day to day activities of the campaign or the management of the campaign in any meaningful sense. My role has simply been to do some surrogate speaking for him at some events he's been unable to attend. I also hosted a fundraiser for him here in Minnesota. CBSNews.com: As I'm sure you saw, there's a new Minneapolis Star Tribune poll out this week that shows McCain a strong second in Minnesota, but still behind Giuliani. How do you think he defeats Rudy Giuliani nationally? Tim Pawlenty: I don't know how this is all going to shake out in terms of the Republican selection process. I think we have many good candidates. I just happen to believe that Senator McCain is well suited to be president. And I have a personal affinity and friendship with him that transcends the race. And I never speak ill or negatively of any other Republican candidates in this race. I know most of them. I'm friends with them. I have a high regard and respect for them, as well. CBSNews.com: Obviously, infrastructure is an increasingly important issue in this country, particularly in your state with the tragic collapse of that bridge in Minneapolis. It will apparently cost about double the original $250 million budget to rebuild. Where do you think the government gets the money to afford these projects? Tim Pawlenty: First of all, infrastructure broadly is one of the important issues facing our country. And we're, you know, 15 to 20 years behind. And both Republicans and Democrats need to recognize that and try to work together to find some common ground to get some increased investments so we can modernize and update the infrastructure in our country. And that includes roads and bridges and dams and water facilities and many other things. One of the basic functions of government is infrastructure. And it should be a priority. So I would hope they would also be able to reallocate money into infrastructure as compared to some of the other places that they put money. There are also some emerging innovations that we should consider, like using electronic sensors to charge for the use of busy lanes on a congested price basis. CBSNews.com: Getting back to Senator McCain, in addition to the Minnesota numbers, there have been stronger numbers in New Hampshire recently. Do you think this is the beginning of a kind of a comeback for him? Tim Pawlenty: Well, it certainly shows some improvement. And obviously he was viewed early on as the frontrunner. Then he was written off by many. And now there's some indication that he has a comeback underway. And I just believe the race is really still wide open. There are generally people who are higher in the polls, but I don't think the dynamics of this race are settled yet. And, hey, I think there's a plausible scenario for any number of candidates to get the party's endorsement. As for Senator McCain, he is the one candidate who has bona fide international affairs and national security credentials. He's also demonstrated himself to be a courageous leader--somebody who is willing to take appropriate risks and work across the aisle to get things done. CBSNews.com: But how do you think a candidate who raised just five million dollars in the last quarter and is still in debt is able to beat these much better funded rivals for the nomination? Tim Pawlenty: I think because he's a known commodity. You know, a lot of the money has to get spent by some other candidates who are less well known to present their case through television and radio. And that causes a lot of money to be spent to raise funds and also causes a lot of money to be spent to get your message out so you can become known. CBSNews.com: You've won Minnesota twice. But Republicans haven't won there on the presidential level since Nixon's reelection in 1972. How does the party win it in 2008? Tim Pawlenty: Well, Minnesota is a challenging state for Republicans but it's not as liberal as it once was. I certainly don't tell people it's a conservative state or a Republican state. It is not. It kind of trends between light blue and purple, depending on the year and the circumstances and the candidates. So it's a state in which the Democrats have an advantage. But it's not such a large advantage that it can't be overcome. And I think the way that it is typically overcome in Minnesota is to show some populism. There's a common streak in Minnesota politics, that you can be a candidate from one party or the other, but you have got to have populist tendencies -- that you're willing to take some risks and not just do everything by the playbook, and that you're willing to be more innovative, more creative and I think people appreciate that. Overall, though, the state is still a light blue state. CBSNews.com: Have you ruled out running on the national ticket as vice president? Will you make a so-called Sherman statement about that? Tim Pawlenty: Well, I said when I ran for reelection in Minnesota that I loved being governor and this is where I want to stay and I intend to fill out my term here. CBSNews.com: But you're not going to say, "if nominated, I will not run--and if elected, I will not serve?" Tim Pawlenty: I did say that I would serve out my term as governor. Tim Pawlenty has served as Minnesota's governor since 2003. He successfully balanced the state budget without raising taxes, reformed education laws, and oversaw significant tort and welfare restrictions. Pawlenty grew up in South St. Paul, Minnesota, and was the only member of his family to graduate from college. A former lawyer, prosecutor, and city council member, Pawlenty served as Majority Leader of the Minnesota House of Representatives. He is Chair of the National Governors' Association and frequently mentioned as a possible GOP vice presidential candidate--and in 2008, Minneapolis will host the Republican National Convention. 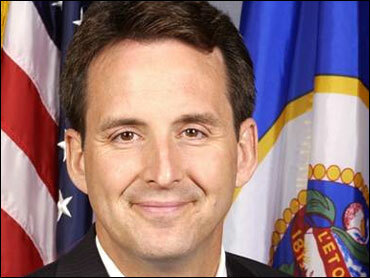 Pawlenty is married with two daughters.